I've been having a rough time lately. Rather overwhelmed by all there is to do any given day/week. The loom and doom is particularly weighty towards the beginning of the week. I always feel more laid back come Thursday. My chores are done for the week, I am approaching the weekend, and there are no regularly scheduled evening activities. But, then I'm like, "oh look! A gap in the crazy. Let's fill it with _______(applesauce, paperwork, bike ride, whatever). So, Thursday ends up not being very restful after all. Looking back over past blog posts, I see this pattern quite frequently in my life. I don't know if I am overly scheduled, or just not handling the school year life rhythm very well. This week I did take time twice to relax and do something for me. Tuesday evening was free for me, so we ate dinner, and then I dove into the newest Rick Riordan novel. His first book in his new series was just published a couple weeks ago. Also, instead of scrubbing my tub, and kitchen and dining room floors yesterday, I took a walk with my sister in law. We got poured on, but it was good for my soul. I've got to remember to do these little things that keep me sane. Not push them off because I've got to make dinner or whatever. Yes, we need to eat, but no, most days we don't need to eat right on the dot of 6:00. It's balance. Keeping pedaling. But occasionally coasting. I am a big fan of stir-fry. Not because I like Chinese food in general (except for all the fried Crab Cheese rangoon), or stir-fry in particular. I like the idea of stir-fry. It is a quite fast dinner. It is easy to fill with fresh, healthy vegetables. And my kids LOVE it. They think it is the best.thing.ever! when they can haul out the chopsticks and go to town. It's not that the recipes aren't delicious...I just prefer Italian and Mexican over Chinese. I have to be in the mood for Chinese. Except, I will make stir-fry even when I'm not in the mood. Since I regularly subject the family to the meals I love (but they might not be completely thrilled about), I guess I can take one for the team, and serve something they love (and that I am not completely thrilled about). It's no skin off my back. This recipe calls for orange juice. I used concentrate that I reconstituted. I thought the orange juice would make the recipe sweet. (I don't do sweet and sour ever. No matter how much I take for the team.) But, it really didn't. It made it taste like orange. It was quite good. Also, the recipe calls for 1/2 pound of snow peas. I bought the 20 or 24 ounce package. And since I had nothing else to do with them, I just tossed them all in the skillet. Good choice. -Start rice cooking, if desired. -Mince garlic. Peel and slice onion. Seed and julienne red pepper. 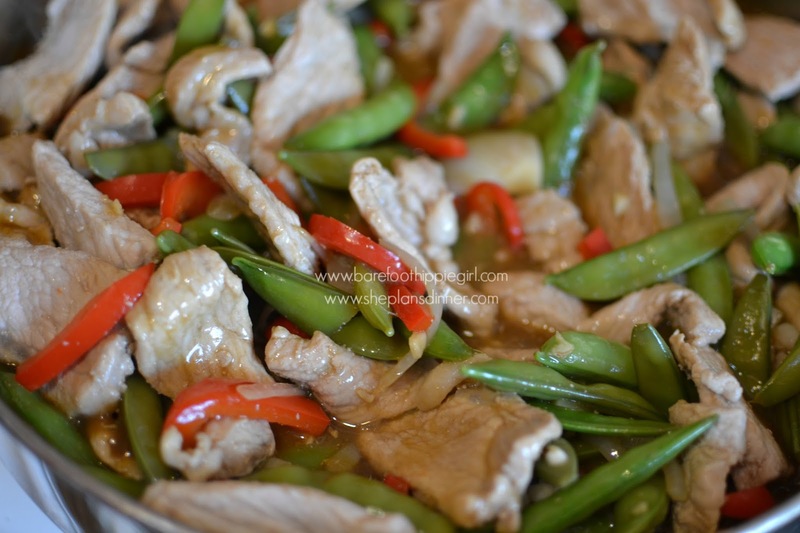 -In a small bowl, combine the orange juice, soy sauce, cornstarch, garlic and ginger. Set aside. 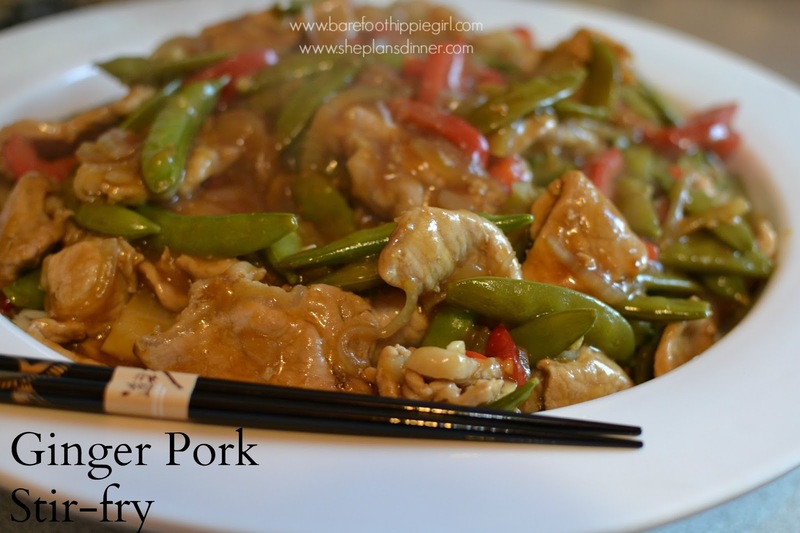 -In a large skillet or wok, stir-fry the pork in oil over high heat for 5 minutes or until lightly browned; drain. Add the onions, pepper, and peas. 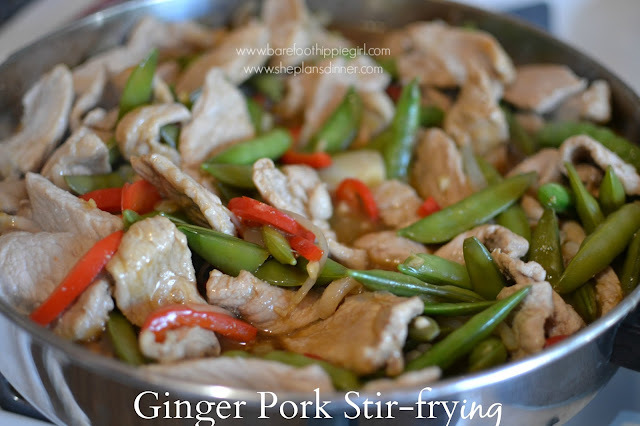 Cook and stir for 3-5 minutes or until crisp tender. -Stir the orange juice mixture; add to the skillet. Bring to a boil; cook and stir 2 minutes, or until thickened.